Orange Maroc is a wholesale provider with a comprehensive portfolio backed with a superior service experience. In a constantly evolving market, Operators need more than just a service provider - they need a partner capable of offering a high-quality network at the forefront of innovation. Our long track record and our policy of building long-term partnerships have earned us the trust of the major carriers and service providers all around the world. Our solutions for international seamless connectivity allow you to expand your backbone through a powerful and resilient network,or provide your customers with a secure international connection, directly reaching any location within Morocco. Through a resilient architecture, Orange Maroc offers protected and highly secured transmission services over based proprietary network facilities. National connectivity supports a wide range of bandwidth and a complete technology portfolio. Orange Hosting solution combines a secure and safe environment, specifically designed to meet international standards within different cities in Morocco. In addition, simple or advanced remote support services can be provided on a 24 hours basis in order to optimize carrier maintenance activity. 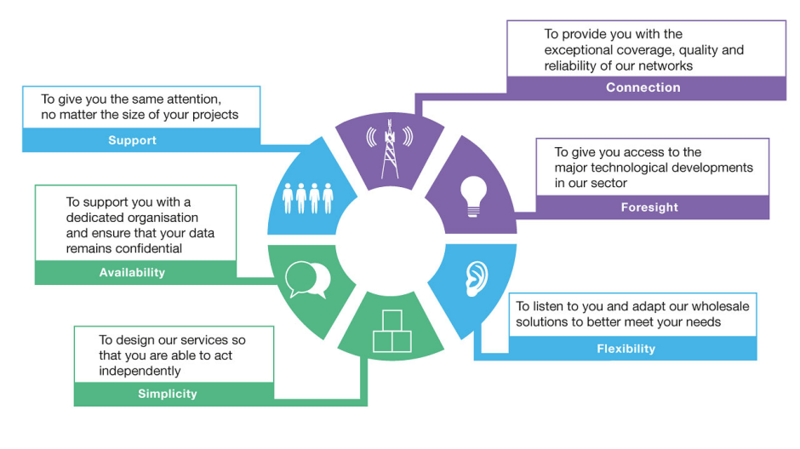 We ensure that you get access to high-quality networks and excellent customer service with our 6 client commitments: support, connection, availability, foresight, simplicity and flexibility.